Bovada Casino has been a well-known name on the global online gambling market ever since 2011. This gambling destination started big, offering its players generous bonuses and hundreds of excellent casino games. 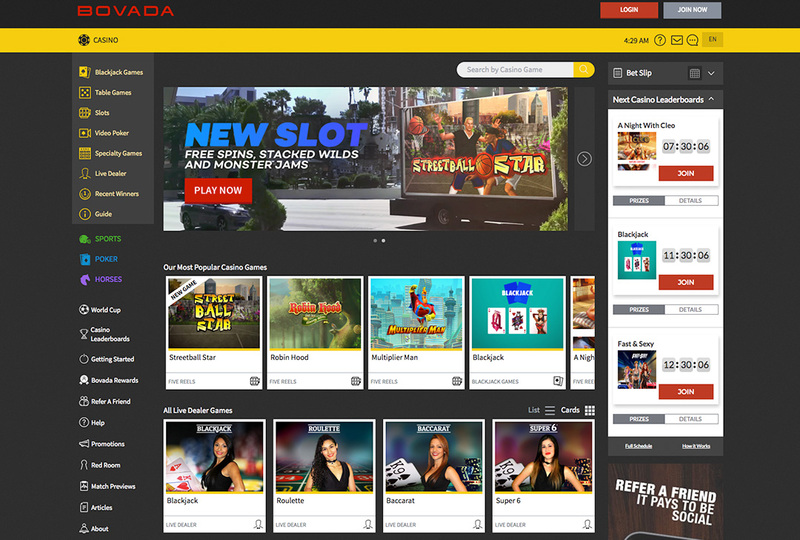 Collaborating with Realtimge Gaming, Rival and Revolver Gaming, Bovada Casino provides exciting video slots, table games and live dealer tables. Furthermore, this is a spot where users can enjoy exclusive casino picks powered by the proprietary Bovada casino software. During the years, Bovada has established itself as a reputable online casino that guarantees fairness and safety to users. Bovada Casino, alongside the operator’s poker, sports betting and horseracing platforms, was launched back in 2011. The name became quickly well known among players, especially within the USA as it was one of the top US-friendly online gambling destinations. At the time, Bovada Casino was operating under the license of the Kahnawake Gaming Commission and was successfully building its customer base. However, in 2017, the operator was forced to voluntarily cancel its gambling license due to regulation changes at the Kahnawake Gaming Commission and it has been operating without a license ever since. Nevertheless, so far, Bovada Casino has been generally respected by its users and the operator often boasts with its massive deposits and fast payouts. In terms of game selection, Bovada Casino offers both exclusive games from its proprietary Bovada casino software as well as fan-favourite picks by reputable game developers like Rival Gaming and Realtime Gaming. The site’s casino game menu counts over 250 titles categorised into slots, table games, live dealer tables and video poker variants. Bovada Casino’s list of recent winners is topped by a $184,372 win on the exclusive A Night with Cleo jackpot slot. 24/7 Live Chat, Telephone, E-mail. Restricted Countries: United Kingdom, Australia, Albania, Algeria, American Samoa, Andorra, Angola, Anguilla, Antarctica, Antigua and Barbuda, Argentina, Armenia, Austria, Azerbaijan, Belarus, Belgium, Bosnia and Herzegovina, Canada, Chile, China, Croatia, Cuba, Curacao, Cyprus, Czech Republic, Denmark, Eritrea, Estonia, Ethiopia, Finland, France, French Guiana, Germany, Ghana, Gibraltar, Greece, Greenland, Grenada, Hong Kong, Hungary, Iceland, India, Indonesia, Iran, Islamic Republic of, Iraq, Ireland, Isle of Man, Israel, Italy, Jamaica, Japan, Jersey, Jordan, Kazakhstan, Kenya, Kiribati, Korea, Latvia, Lithuania, Luxembourg, Macao, Macedonia, Montenegro, Montserrat, Morocco, Mozambique, Myanmar, Namibia, Nauru, Nepal, Netherlands, New Caledonia, New Zealand, Norway, Poland, Portugal, Puerto Rico, Qatar, Reunion, Romania, Russian Federation, Serbia, Seychelles, Sierra Leone, Singapore, Sint Maarten, Slovakia, Slovenia, South Africa, South Georgia and the South Sandwich Islands, South Sudan, Spain, Sweden, Switzerland, Tunisia, Turkey, Turkmenistan, Turks and Caicos Islands, Tuvalu, Uganda, Ukraine, United Arab Emirates, Uruguay, Uzbekistan, Vanuatu, Venezuela, Vietnam, Zambia, Zimbabwe. Bovada Casino offers a unique gambling experience to casino fans thanks to its proprietary Bovada casino software as well as numerous exclusive games. However, it currently operates without an online gambling license, so that’s something players must have in mind when deciding whether to join this otherwise reputable gambling site or not. New customers at Bovada Casino are in for a juicy treat as the operator welcomes them with a 100% match bonus up to $1,000. For the atmosphere to become even hotter, this offer can be claimed up to three times per customer; in other words, newbies can claim up to $3,000 on their first three deposits at Bovada. In order to claim this generous bonus offer, users must use the bonus code NEWWELCOME each time they make a payment of at least $10. This welcome offer not only is pretty attractive due to the max bonus amount, but it also is attractive due to the reasonable playthrough requirements of 25 times bonus plus deposit amount. Players must have in mind that bonus funds cannot be used for the live dealer games as well as craps; all the other games in the casino platform contribute towards meeting the minimum wagering requirements. 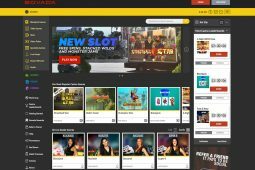 Two other bonuses and promotions casino players may find interesting at Bovada is the $5,000 bitcoin welcome offer as well as the refer-a-friend offer. Those using the code BVCBITCOIN150 can claim a 150% match up to $1,500; this code can be claimed up to three times. There are three additional $500 bonuses for the sports platform. Those referring their friends, on the other hand, are eligible for a 200% of the friend’s first deposit up to $100. The number of such bonuses is unlimited, meaning players can refer as many friends as they wish. Bovada Casino is a top spot that features games by well-established casino game providers such as Realtime Gaming and Rival Gaming. Additionally, the casino’s game lobby features picks by smaller gaming companies like Revolver Gaming, which provide fresh playing titles to curious players. Finally, the operator has a great deal of proprietary casino titles that cannot be played anywhere else. Consequently, the site boasts with over 250 games neatly categorized into appropriate sections including slots, table games and live dealer options. Bovada Casino doesn’t have a long list of deposit and withdrawal methods and that can be an issue for certain players. Plus, the operator charges fees that are often absent at other reputable gambling destinations. Players at Bovada Casino can use credit and debit cards only to make a deposit at their account. All such transactions are processed instantly by the operator and come with no fees if made in bitcoin. The first credit/debit card deposit is free, while subsequent payments come with a 5.9% (Visa and Mastercard) or 9.9% (American Express) fee. In terms of depositing limits, credit and debit payments cannot be less than $20 and more than $1,500 per transaction. Bitcoin depositing limits, on the other hand, are different and range between $10 and $5,000 per transaction. Customers can request a withdrawal from their Bovada Casino account only via bitcoin and check by courier. Moreover, the operator limits the use of these respective methods to 1 per 3 days or 1 per 7 days. A positive thing in this regard is the fact that once approved, bitcoin cashouts are processed within 15 minutes. The minimum withdrawal amount using bitcoin is $10, whereas the max cashout is $9,500. Players cannot withdraw less than $100 or more than $3,000 when using check by courier. Every non-bitcoin cashout within 90 days is free of charge, while all other request will come with a $100 processing fee. Reputable gambling operator with years of experience. Over 250 games, some of which are exclusive picks. Massive welcome offers for both cash and bitcoin depositors. Currently operating without a remote gambling license. Lack of multi-million progressive jackpot games. Very limited selection of deposit and withdrawal methods. No seals of approval or reports by independent auditors. Bovada Casino used to be a top player on the online gambling market for years. However, recently it has noted certain issues with customers and it remains unknown whether the operator holds a gambling license or not. Therefore, those that trust a company that has been successfully working ever since 2011 will certainly enjoy the massive welcome offer and the entertaining games; the rest should maybe stick to other online casinos that hold licenses and seals of approval by reputable authority bodies. Ready to Play at Bovada Casino?